It’ll soon be feeling like Christmas in August, when on Thursday August 16th, we’ll be airing the Christmas Special Are You Being Served? 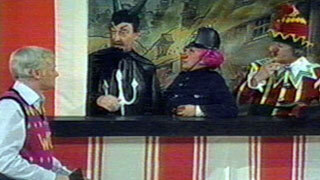 episode "Punch and Judy," which originally aired in the U.K. in 1979. Then on Friday, August 17th, in the same 3:30pm time slot, we’ll have the 2016 Christmas Special episode of Still Open All Hours. The following week Afternoon Tea will be preempted for some special programming, but the comedies return Monday, August 27th, with Still Open All Hours continuing to replace Are You Being Served?, which takes a break for a while. 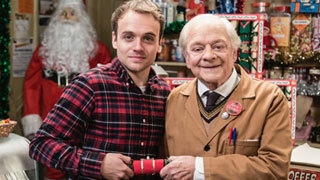 This summer, David Jason, who stars as shopkeeper Granville in Still Open All Hours, has been working on a brand new travel series which has taken him all over the Pacific West Coast. David Jason: Planes Trains & Automobiles sounds like it’s Jason’s dream job. Not only is the 78-year-old actor a pilot, but he is also known for his love of trains. Now, he’s finally getting to fulfill his “lifelong ambition” by riding the Amtrak Coast Starlight train from Seattle to Los Angeles. Along the way, Jason will be stopping off to experience feats of engineering that include flying on a DC3 vintage airliner, driving the latest American Super Truck, and investigating the prospect of sub-orbital space flight. The five-part series will air in the UK next year. Jason’s obsession with transportation was never more evident than when he was working on A Touch of Frost back in the early 1990s, where he’d relax by making ships and planes from plastic models. Apparently he turned his on-set caravan into a workshop, used an old makeup case to keep his modeling tools in, and became so skilled that he even created fairly large launchable rockets that were able to fly as high as 900ft. His masterpiece was a Saturn V replica which he launched from a launch pad made from an old lighting stand. You can see Jason on Friday, August 17th at 3:30pm in Still Open All Hours, and then starting Monday, August 27th every weekday afternoon at the same time.